Tackle selection for the North Fork is not a difficult chore. Most of the following recommendations are items the average angler already owns, so a trip to Myron’s won’t break the bank buying new gear. In this tackle section I have covered the basics: rods, reels, lines and leaders, and wading equipment. I have not gone into such things as what dry fly floatant to use or what size split shot to throw with a Mohair Leech. I tried to stick with the big issues. The North Fork is a large river compared to some of the other spring fed streams in the state of Missouri. If your are used to fishing the small streams, the North Fork will be a nice change and sometimes a little overwhelming. Even anglers that have fished the River before walk down from the Chalet and ask themselves “Where do I start?” There is quite a bit of water, however, if you break up the river into smaller sections, work them thoroughly, then move on to the next section, you will be into fish. Good luck. Every tackle section I’ve read always starts with the fly rod. I am certainly not going to deviate from tradition. When I managed Clearwater Fly Shop in Columbia, Mo. I always told folks who were getting involved in our sport to spend the largest percentage of their tackle money on the rod. Obviously it is the most important piece of equipment. If you get the Wal-Mart special for $39.95, well, you get what you pay for. They are usually heavy, and, because of noodle-like performance, unable to fish in a variety of conditions, such as wind. Buy the best you can afford and you won’t be disappointed. On the market today there is a great selection of low priced rods from big name rod makers, such as, Scott Alpha Series, Sage DS, and St. Croix Imperial. These lower priced models don’t have the highest level of technology or all the aesthetics of their big brothers, but perform great and are still unconditionally guaranteed for breakage. But what if I’m the next Dave Whitlock, you say to yourself, and have more rods than I know what to do with, which one do I use? Well, you are going to need a rod that can cast nymphs, split shot and a strike indicator, then mend this set up across several current lanes. You will also need a rod that can present dry flies somewhat delicately. Oh yeah, and a rod that can fish a medium size sculpin pattern across the bottom. A 9ft 5-weight with a quick action or a 9ft 6-weight with a moderate action will do all of these things. If you are not going to be fishing sculpin patterns and the like, you can get away with a slower 5-weight. I like the rods I use on this river to be at least 8 feet, preferably 9 feet. The longer rods not only help in the mending of line while fishing nymphs, but also make it difficult for me to embed them in my skull. Due to the large size of the river a long rod feels right at home. For a point of reference, I use a Scott Eclipse Series 9 foot, 3 piece, 5-weight, which has a quick action. It casts and fishes similar to a Sage VPS (formally RPL), and R.L. Winston LT.
A single action fly reel with a disc drag is the best reel to have. Most days fishing the disc drag is pure overkill, however, it is invaluable when a 20-inch stream bred rainbow runs for Norfork Reservoir. The words “disc drag” used to mean expensive; but then VCR’s used to be price prohibitive. Now both are affordable. It is tough to make recommendations because you can’t swing a dead cat without hitting a reel company. Some of the smoothest and most reliable are: Abel, Ross, Bauer, Galvon, Lamson, Scientific Angler, Cortland, and many, many more. 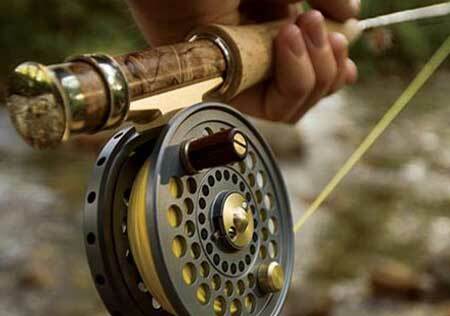 The reels are an area of tackle where buying the best you can possibly afford is not necessarily the best policy. In other words, a medium priced reel usually has all the important features (i.e. smooth disc drag and machined frame) of the expensive reels except the price. If you want to pay for the extra bells, whistles and high-end brand name, knock yourself out. The high-end companies have those reputations for a reason, their reels are the best in all aspects and you won’t be disappointed. For the North Fork I recommend a weight forward taper floating fly line that is balanced with your rod. A weight forward can cast any fly combo well. Including dry flies. The myth seems to be that a double taper presents dry flies better. I have never had a problem presenting dries with my weight forwards. They’re all I fish. Sinking tip and full sinking lines also have their place on the North Fork. They are great for working large flies near or on the bottom. A fairly fast sink rate will be needed due to the river’s quick flow. A leader selection of knotless tapered leaders with tippet diameters of 3X, 4X, and 5X will suffice. My favorite leader is a 9-foot knotless tapered down to 4X tippet. With this set up I can fish the deadly Rubber Leg Stonefly with a Prince Nymph as a dropper near the bottom or can add 5X tippet off a spool and fish an Elk Hair Caddis. Waders are a necessary evil in the cooler months and wading boots are a must at all times of the year. The North Fork in some places has a bedrock bottom coated in algae, which can be incredibly slick. Since felt soles were outlawed 3/1/2012, to prevent the spread of Didymo (Rock Snot) in Missouri’s streams, we recommend the new rubber soled wading boots. However, rubber soles are no guarantee of adequate traction and it is rare not to take an unplanned dunk in the river. If you are an aggressive wader, it is not a question of if you’ll take a dunk; it’s a question of when. Just be safe, have some dry clothes back at the cabin and know that everyone that fishes the river the way it should be fished has done the same thing. The truly “bad” aspect of being baptized by the river isn’t the soaked clothes or your buddies riding you, but somehow the river water soaks into your pores and goes straight to your brain. Then at your next staff meeting or on the commute home or when you neighbor is asking you to cut your grass more often, the river water in your brain takes over and all you can think about is The River. But I guess that isn’t a bad thing, is it?